World Bank Publications, 2004. Paperback. Very Good. Disclaimer:A copy that has been read, but remains in excellent condition. Pages are intact and are not marred by notes or highlighting, but may contain a neat previous owner name. The spine remains undamaged. An ex-library book and may have standard library stamps and/or stickers. At ThriftBooks, our motto is: Read More, Spend Less.Dust jacket quality is not guaranteed. World Bank Publications, 2004-04-13. Paperback. Good. 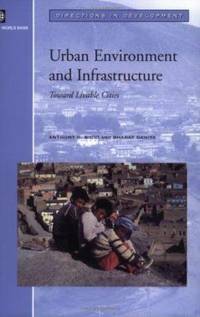 Washington, DC: World Bank Publications, 2004 Book. 5. Trade paperback. First edition. First printing.. Fine. Clean and unmarked, as new. Binding tight. Not ex-library. Trade paperback (US). Glued binding. 149 p. Contains: Illustrations. Directions in Development. Audience: General/trade. All proceeds benefit the Burlingame Public Library.. The World Bank, 2004. This is an ex-library book and may have the usual library/used-book markings inside.This book has soft covers. In good all round condition. Paperback. New. 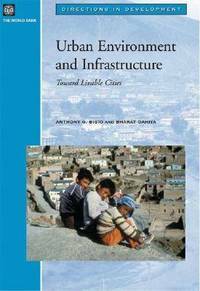 A review of the World Bank's activities to improve urban environmental quality, this text sets out the it's expanded brown agenda and emphasizes the importance of infrastructure and environmental interventions to improve livability in cities in developing countries. It provides recommendations on how to deal with the challenge of this agenda. World Bank Publications, 2004-04-13. Paperback. Used:Good. 2004-04-13. Good. Ships with Tracking Number! INTERNATIONAL WORLDWIDE Shipping available. May not contain Access Codes or Supplements. May be ex-library. Shipping & Handling by region. Buy with confidence, excellent customer service!